It's Fashion Week in New York. In the past, I've only viewed the event from afar, watching a few runway shows streamed live on the web. While there are lots of shows--90 fashion shows at Lincoln Center plus roughly 250 shows scattered around the city--they all require an invitation. This year, I had the good fortune of getting two invitations! My son, a design student and photographer for Style Alternative, was my guide. 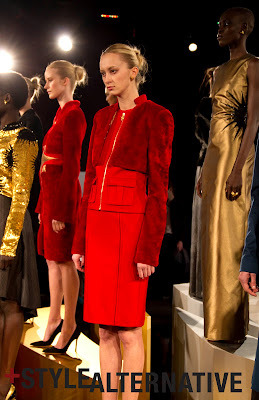 The first show, a presentation of Mathieu Mirano's Fall 2012 collection at Lincoln Center, was last Sunday. Here's a few photos we snapped at the event. I arrived at Lincoln Center before my son and got a chance to take in the scene outside the David H. Koch Theater. A fashion show must have ended recently, because there was a steady flow of super tall, skinny, very made-up, young women leaving the building. I wasn't the only one milling about outdoors. There was a small pack of paparazzi, cameras in hand, ready to pounce as soon as a model pushed through the glass doors. The photographers were like football players chasing a fumbled ball, muscling in on each other, angling for the best shot of the models. There were also a few young women, who I suspect were bloggers like myself. At least I assume they were bloggers because they weren't as aggressive as the professional photographers. When my son arrive, we went inside. 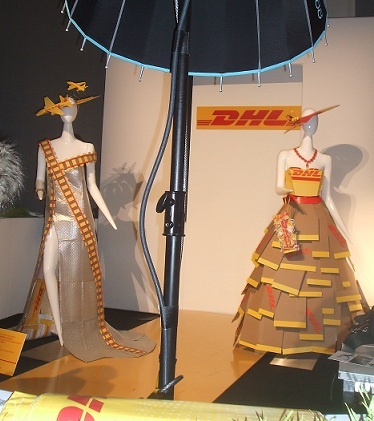 It was a typical event scene, including large screens showing runway shows and product booths. The Mirano presentation was held in a tent with high-ceilings, dark around the perimeter, but glaringly bright in the center, where the models stood on a tiered stage. Being a Fashion Week novice, I didn't realize that some collections are shown in a presentation format, rather than a runway. My son says the advantage is that it gives photographers a chance to zoom in on garment details--as opposed to grabbing shots of models in motion on the runways. Once again, there were photographers angling for the best shots of the models, but without, thank goodness, the zeal of linebackers. In fact, everyone was very polite. And everyone was checking out everyone, even me. I had to laugh. You know how women of a certain age feel invisible in society? Not so at fashion shows. Since these events are invitation only, everyone assumes you must be somebody. People looked at little old me and I could tell they were thinking (for a brief moment, anyway): Is she someone I know? Is she someone I should know? 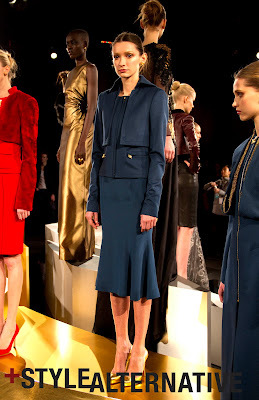 The Mirano 2012 fall collection consisted largely of skirt suits, evening dresses and gowns. I liked it a lot, but then, I'm drawn to classic styling with a few unexpected details. I also like feminine suits. Zippers, fur, extra pockets and folds make it clear that these suits are not for men. I had to take this next photo. If you're wondering why the models look so grim in the other snapshots, maybe it's the heels they're wearing. The New York Times calls the runway model look the "coolly robotic Eastern European beauty ideal," but I call it sad. I actually liked many of the Marino designs, but it didn't look like the models did. They look miserable, don't they? I get most of my styling ideas from observing other women. I don't remember ever thinking: "I love that woman's grim look!" Instead, I admire women who look happy and confident in what they're wearing. If you're curious about Fashion Week, you can take at peek at some of the action on YouTube.